"I think the one telling thing to me was that he never wanted to talk about the end," Begay, a close friend and former team-mate of Woods at Stanford University said. "He never wanted to talk about this window that was closing on him, that many of us in the world of golf thought was beginning to signify that he wasn't going to be able to play at a high level again, much less win a major championship. "I know that sometimes he would have questions about how far he could come back and whether or not to even decide to pursue it. "But when he decided to pursue it, I think he just left the outcome as an unknown and wanted to put his best foot forward, put everything into it and this is what you get - the guy's just a remarkable athlete. "He's really matured over the last few years and a lot of it had to do with the fact that he had to deal with his human side. "When you're injured and hurt and the future is sort of uncertain you start to ask yourself a variety of different questions and I think he came up with some really great answers and started to put a lot of his time into other things that were of interest to him. "I think it really helped him develop as a father, as a friend and you saw at the end, Charlie and Sam wanted to be next to their dad. "Jokingly throughout the last year or so he would talk about them not having ever seen him play at the highest level. "He gave them a little glimpse into it at the end of last year at the Tour Championship and an even bigger glimpse into it on Sunday. "It was an exhibition of patience and championship-level type of golf." Asked if he ever thought it would be impossible for Woods to reach such heights again, Begay told the Golf Channel: "Yes, absolutely. "It was after the second surgery and I went to visit him and I walked in and he was unable to get up out of his chair to give me a hug. "We had to go pick his kids up from school and he asked me to drive him. "He was unable to walk to the car under his own power, he put his arm around me and I sort of helped shuffle him off into the car. "He was unable to sit upright, had to recline the seat back. That was a reality check for me, but seeing this guy's desire and what's in his heart, it's unparalleled. "This could be one of the greatest achievements in sports." 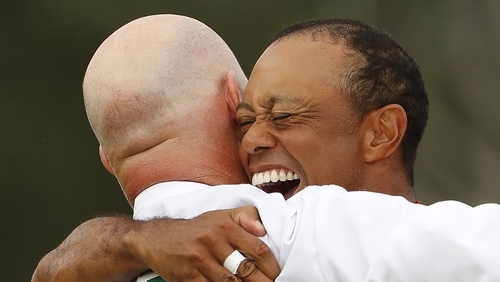 Former Ryder Cup captain Paul Azinger believes Woods' victory sets up one of the most interesting seasons "of all time". "It's like a miracle," Azinger said. "We are watching a living, walking, breathing miracle to be able to play at that level with a fused back. "I really felt he had gone out like a bottle rocket - that he'd gone. But that's not what is happening at all and we are the lucky ones."